Fans of the third person shooter, Star Wars: Battlefront were given A New Hope at E3 as EA finally showed a sneak peak of in-game footage. Ok, so there may have no actual current in-game footage shown, but DICE Studio were kind enough to show us some early in-game footage which included the snowy wasteland, Hoth along with a Speederbike navigating through the trees of the forest moon of Endor. Whilst the lack of content in the video confirms that the title is still far away, it certainly shows the dedication that DICE Studios are putting into the game, visiting set locations and examining movie props to allow them to create an immersive experience that is true to the Star Wars universe. Even though the video doesn’t show much, it certainly raises lots of questions as to what maps, weapons and vehicles will be available as well as whether or not we’ll see a Return of the Jedi, a feature which was implemented into Star Wars Battlefront II which allowed players to control a Jedi in the battle. Unfortunately there is no definite date set for release, however the games Wikipedia page claims it should be about during summer 2015. 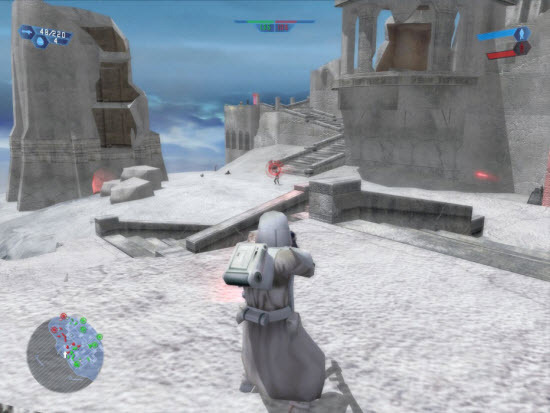 Star Wars Battlefront was originally announced at last year’s E3 where a short video teased that the game was coming back and would be build on the Frostbite 3 engine.